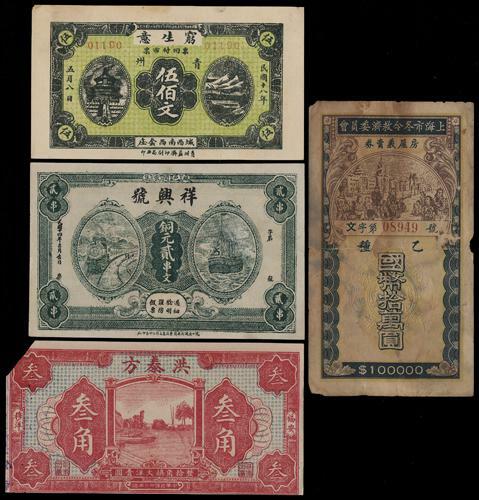 A group of 4 ROC banknotes, comprising Central Bank of China 1948 $5000 ABNC uniface SPECIMEN, front part only, $10000 ABNC uniface SPECIMEN, reverse part only, 1941 Bank of Communications Dah Tung Print $10 x 2 remainder. AU. 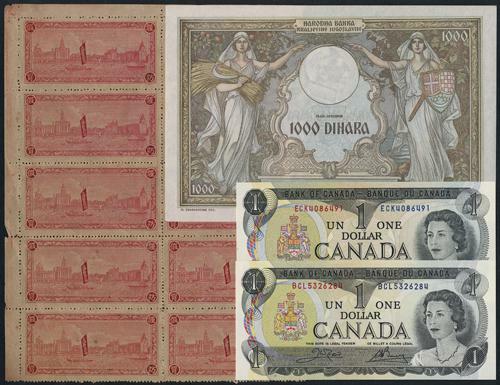 A group of 4 private bank notes, one with torn corner, other About Fine to UNC. 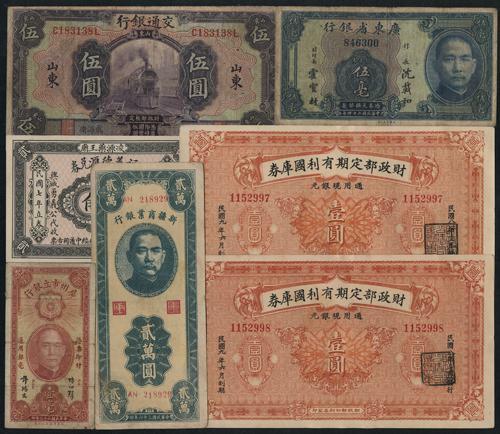 A group of 22 China and Hong Kong notes, including Central Bank of China, People's Bank of China, Private Banks, Saving Certificate, Hong Kong HSBC, Government, Chartered Bank notes. Please view. 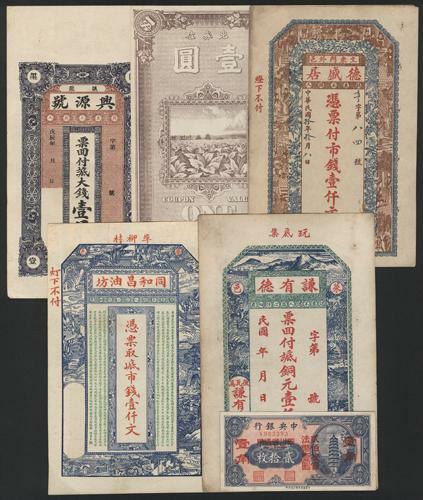 A group of about 24 China and worldwide banknotes and a block of 10 Shanghai view Shin Chang seals, an interesting group. Please view. 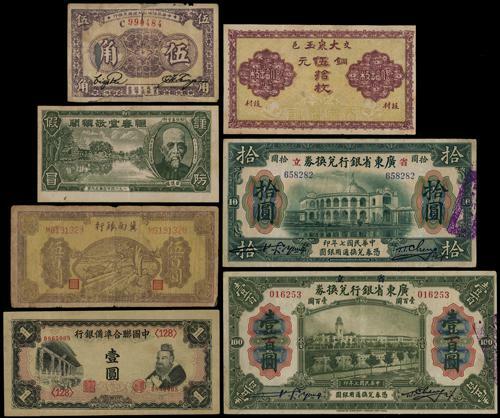 1910-40s an accumulation of about 120 China and worldwide banknotes, mostly China notes, including ROC National Banks, Private Banks, Provincial Banks, Japanese Puppet Banks, Soviet China, Liberatied Area notes, etc. Need viewing. 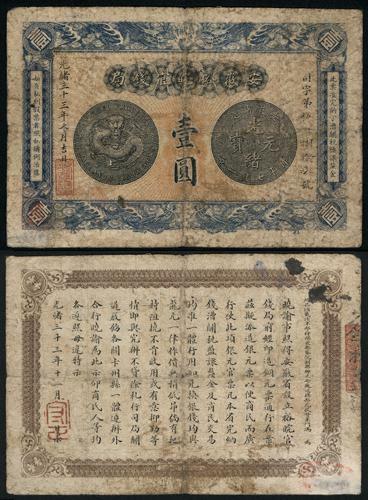 1917-41 a group of 4 ROC notes, comprising 1917 Hunan Bank 10 Coppers, 1929 Provincial Bank of Hopeh 10c Tientsin, 1938 Kwnagsi Farmers' Bank $5 and 1941 Kiangsu Farmers' Bank $1. Fine to XF. 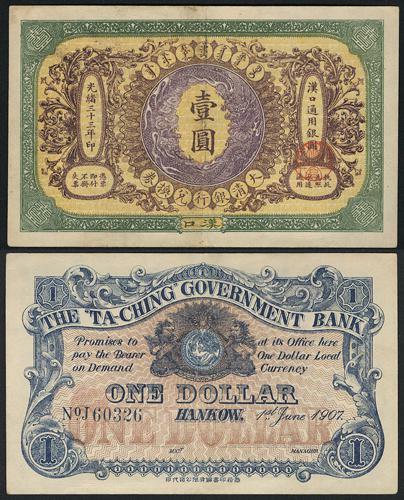 1918-47 a group of 6 ROC notes, comprising 1918 Private Bank 20c, 1920 Treasury Bond $1, 1927 Bank of Communications Shangtung $5, 1933 Canton Municipal Bank 10c, 1935 Provincial Bank of Kwangtung 50c and 1947 Sinkiang Commercial Bank $20000. Fine to AU. 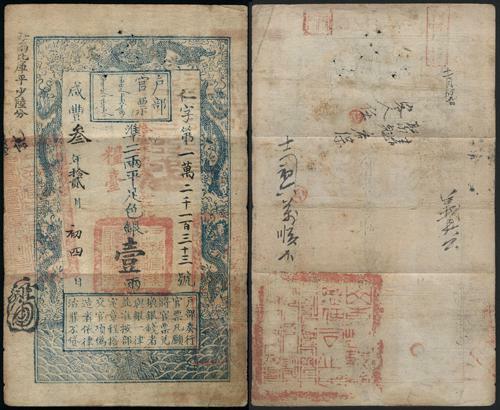 Board of Revenue: Hsien Feng Year 3 (1853) One Tael, serial no. : 26631. Paper two layers separated. Fine. 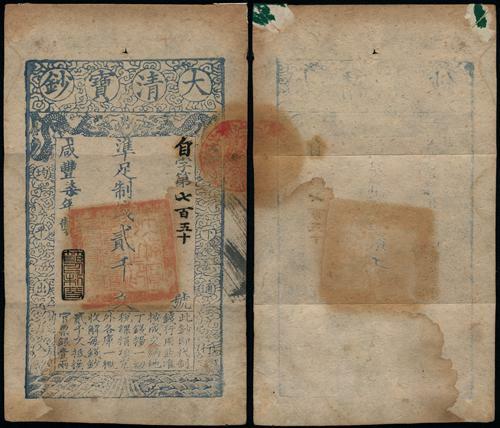 Board of Revenue: Hsien Feng Year 3 (1853) One Tael, serial no. : 12133. With overprints. About Very Fine. 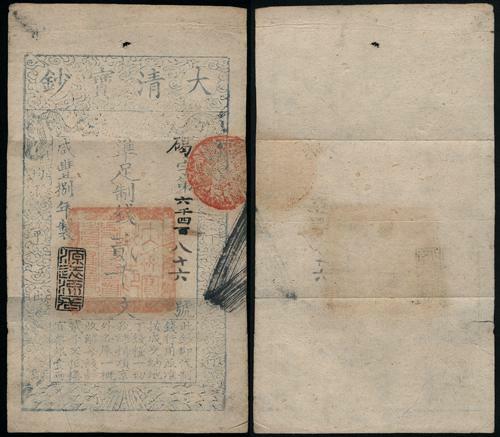 Board of Revenue: Hsien Feng Year 5 (1855) One Tael, serial no. : 33808. With overprints. About Very Fine. 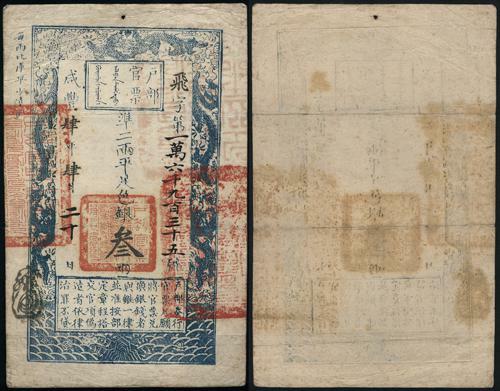 Board of Revenue: Hsien Feng Year 4 (1854) Three Taels, serial no. : 16935. Very Fine. 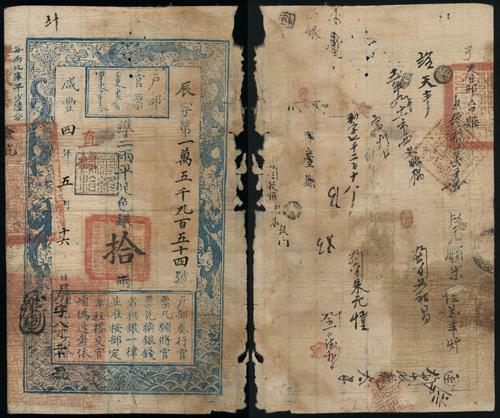 Board of Revenue: Hsien Feng Year 7 (1857) Five Taels, serial no. : 43184. With red overprint. 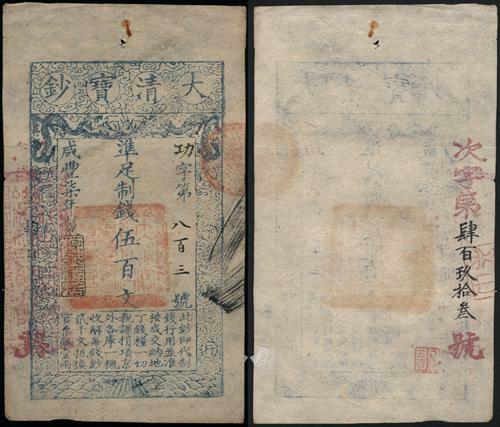 Hsien Feng Year 7 Board of Revenue note are very rare. Good Fine. 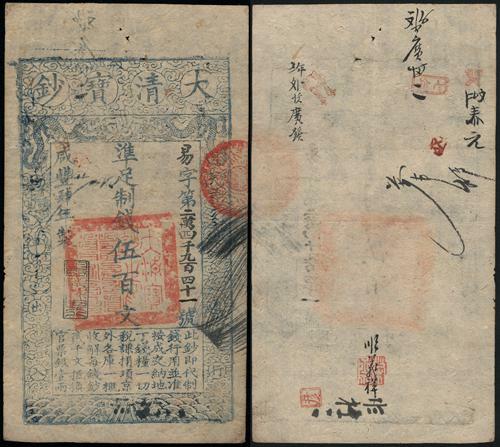 Board of Revenue: Hsien Feng Year 4 (1854) 10 Tael, serial no. : 15954. Overprint "Chihli". Dmaged at right margin, otherwise Good Fine. 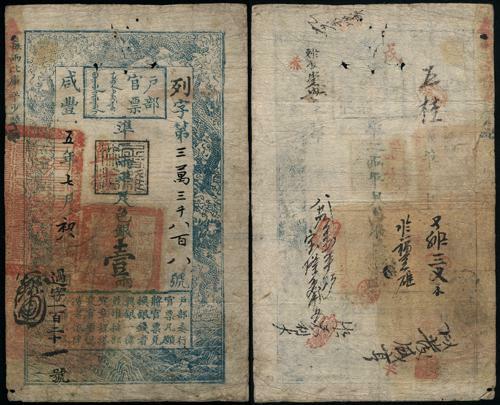 Ta Ching Pao Chao: Hsien Feng Year 4 (1854) 500 Cash, serial no. : 24941. About Extremely Fine. 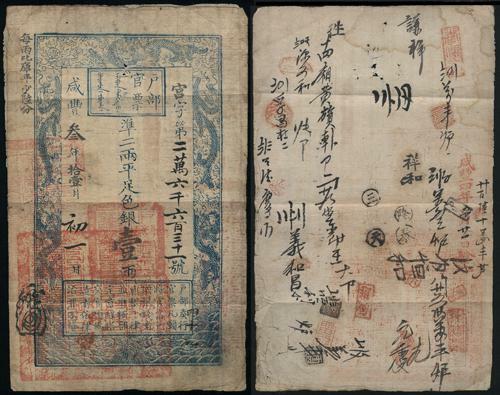 Ta Ching Pao Chao: Hsien Feng Year 7 (1857) 500 Cash, serial no. : 803. Extremely Fine. Ta Ching Pao Chao: Hsien Feng Year 4 (1854) 2000 Cash, serial no. : 8125. AU. Great condition. 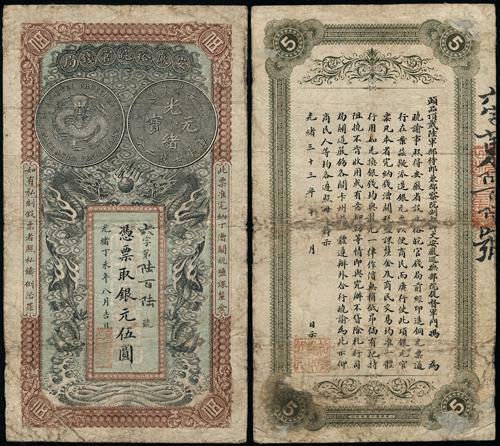 Ta Ching Pao Chao: Hsien Feng Year 7 (1857) 2000 Cash, serial no. : 750. Water stained at bottom. Very Fine. 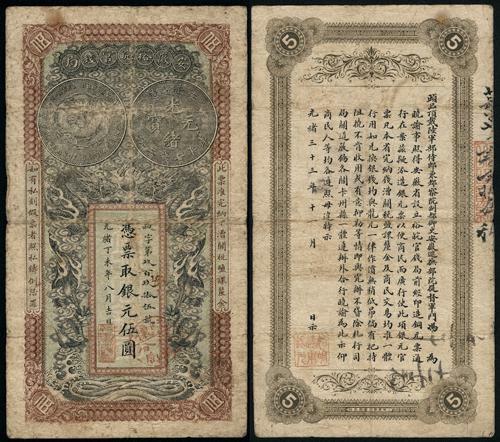 Ta Ching Pao Chao: Hsien Feng Year 8 (1858) 2000 Cash, serial no. : 6486. About Extremely Fine. 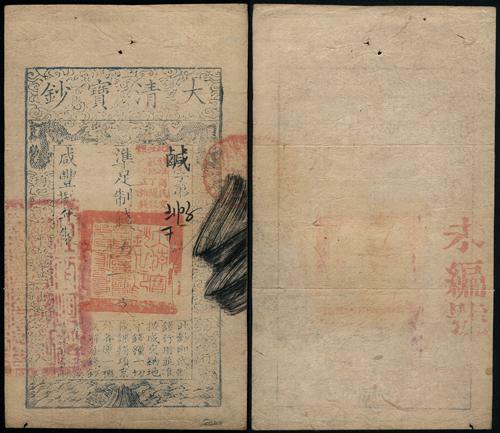 Ta Ching Pao Chao: Hsien Feng Year 8 (1858) 5000 Cash, serial no. : 6205. About Extremely Fine. 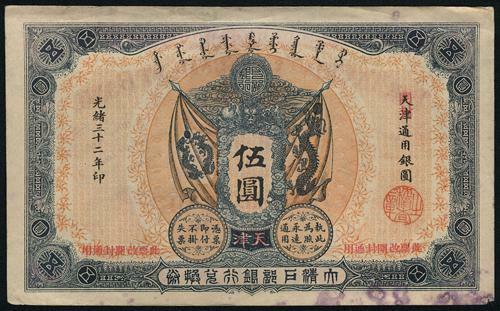 The Ta-ching Government Bank: Kwang Hsu Year 33 (1907) Hankow $1, serial no. : J60326. About Extremely Fine. 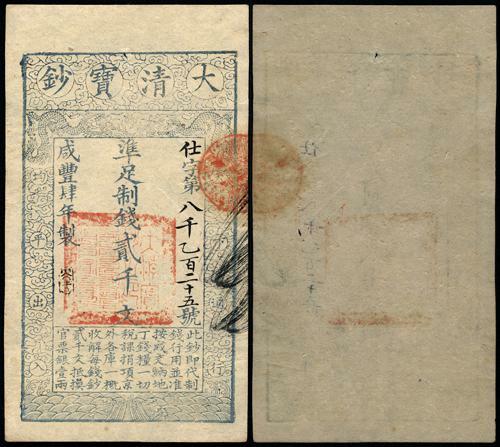 The Ta-Ching Government Bank: 1906 Kaifeng on Tientsin $5, serial no. : 59002. Stained at lower margin, otherwise XF. Anhwei Yu Wan Official Bank: 1907 $1. Good. 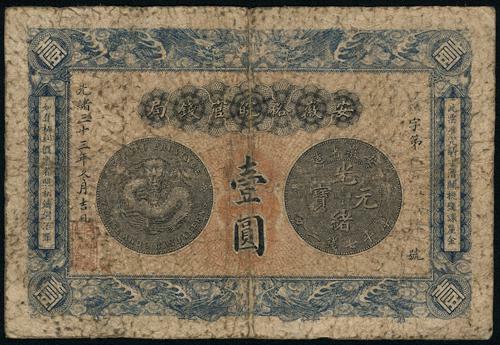 An Hwei Yu Wan Government Bank: Kwang Hsu Year 33 (1907) $1, serial no. : 589. About Fine. 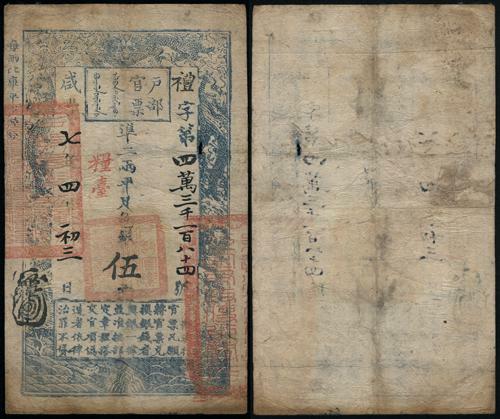 An Hwei Yu Wan Government Bank: Kwang Hsu Year 33 (1907) $5, serial no. : 995. About Fine. 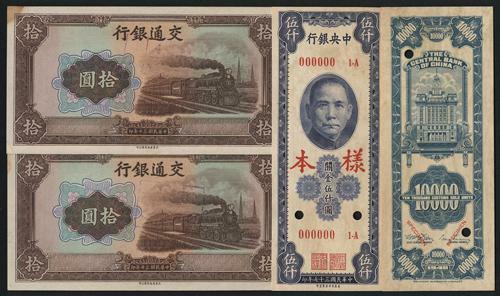 Anhwei Yu Wan Official Bank: 1907 $5, serial no. : 606. Fine.